The Haemophilia Market is driven by clotting factor concentrates. Besides hemophilia A and B, and those with von Willebrand disease (VWD), is also sometimes treated with clotting factor. Currently about 20,000 people have hemophilia in the US; about 80% of them have hemophilia A, and 3,000 to 4,000 have hemophilia B. About 400 US babies with hemophilia are born each year. Von Willebrand disease is the most common bleeding disorder, affecting about 1% of the population. In the Haemophilia world; diseases are cured by factors like Hemophilia A patients use factor VIII (FVIII), Hemophilia B patients use factor IX (FIX) and VWD patients use factor VIII with VWF (VWF/FVIII complex). The Recombinant hemophilia market is set to take over the market place with the long acting treatments in the major markets; the US, France, Germany, Italy, Spain, UK and Japan by the beginning in the US in 2014 and the European countries (5EU) in 2015. The launch of Biogen Idec and Sobi’s long-acting therapies for hemophilia A and B will affect the position of Baxter, Bayer and Pfizer’s market- leading therapies. These long acting therapies will give a significant increase in sales to the hemophilia market. Understand Haemophilia Market with our Reports. Get the deeper understanding of the long-acting recombinant factor VIII and factor IX therapies and its impact on the on current treatments for hemophilia A and B and VWD. 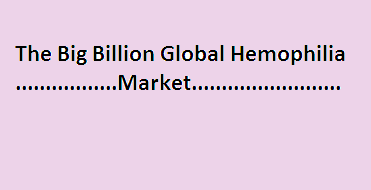 Global sales forecasting of the Hemophilia Market till 2016 for the individual marketed products. Get access over pipeline drugs, the technology, stage of development, their targets, mechanism of action with our Pipeline reports. Our reports can be customized to include any specific information that you might interested in. Send us an email with your requirements and our team will get back to you instantly. This entry was posted in Hemophilia Market and tagged Asia, Baxter, Bayer, Biogen Idec, Blockbuster drugs, Business Consultant, Company Overview, company profiling, CSL Limited, DelveInsight, Discovery, Drug, hemophilia A, hemophilia B, Hemophilia Market, Long Acting Treatments, Market Forecasting, Market Increase, Marketed drugs, Pfizer, Pipeline, Sobi, Von Willebrand disease.